The Prisoners’ Rights Project advocates for human rights in Cameroon’s prisons. One of the biggest human rights issues facing Cameroon today is prisoners’ rights. Accused and convicted inmates of the country’s prisons and police/gendarmerie cells suffer from the numerous life-threatening conditions of these facilities, including insufficient food provisions, inadequate medical attention, overcrowding, and violent and degrading treatment at the hands of guards, police, and other staff members. These conditions are compounded by the degeneration of criminal procedure standards: arbitrary bail, judicial inefficiency, and even administrative errors resulting in lost paperwork and forgotten prisoners. Resolving these issues has been a priority for GCI since the beginning of the organization, resulting in the formation of the Prisoners’ Rights Project (PRP) in 2008. The PRP aimes to improve prison conditions and protect inmates’ rights by collecting data on incarcerated persons, organizing education and training sessions for prison workers, mobilising and coordinating civil society to support prison communities, and providing legal assistance and representation to prisoners who are awaiting trial or that have been subjected to human rights violations. GCI monitor conditions and practices in the prisons, pursue systemic change and policy reform, and conduct training and outreach. We enthusiastically work with those involved in the prison system including prisoners, prison officials, lawyers and others who share our dedication to human rights. The Global Conscience Prisons Project was conceived due to the horrible conditions of prison facilities in Cameroon and the deplorable and life-threatening conditions of inmates in the prisons. The project takes into consideration conditions in all places of incarceration to include police and gendarmerie cells, prisons, and more especially the situation of inmates in these facilities. 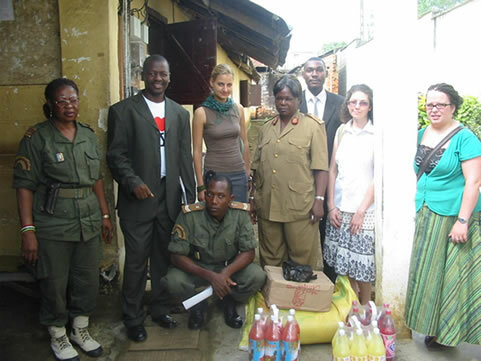 The first phase of the GCI Prison project has been the conduction of needs assessment surveys of incarceration facilities and the organisation of consultative workshops with police/gendarme officers, current and retired prison workers, civil society activists, Journalists, clergymen, ex-convicts, etc. to discuss basic standards for incarceration facilities and for the treatment of all persons deprived of their liberty. The Project entails the collection of data on persons incarcerated in police/gendarmerie stations and in the Prisons, education and training for prison workers, mobilisation and coordination of civil society support for prison communities, and the provision of legal assistance and representation to indigent detainees and prisoners. Global Conscience hopes to mobilise assistance for the realisation of improved incarceration facilities that meet international expectations, and is already working on a project for a 50-cell prison for two hundred untried prisoners in Kumba.